The idea is to rank high in Search Engines (Google Bing being the top dogs) and earn free traffic with content that helps people and can potentially earn you money. WA have been teaching this for over 10 years and it works. 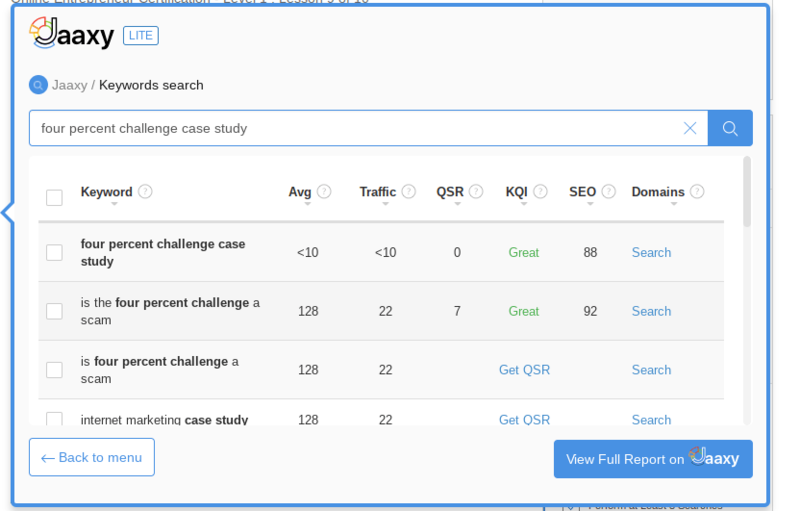 Success is dependent on the keyword research (understanding how easy or hard it will be to rank highly) and the quality and quantity of your content. This is a mix of art and science and results cannot be guaranteed. Though consistent quality is a winning strategy. The Four Percent Challenge (FPC) product is important for my business. It's a product that at this point I love though it's only in phase 1 and therefore not yet complete. The FPC is a relatively new product and so keyword research figures are going to be low. I also anticipate a growing interest in this product as news of it gathers pace. I am a promotional partner of Four Percent and providing the product retains it's quality don't expect this to change. Therefore attracting visitors interested in finding out if the Four Percent Challenge and core products work is important to my business. Personally I prefer consuming case-studies than product reviews as they normally tell me way more about the product. In trying to provide the most help to people interested in FPC I feel journalling my experience will be very helpful especially as I have opted to use a couple of less costly tools to help keep my costs down. So the intent of the content is to provide great information and only encourage click throughs to the Four Percent Challenge sales funnel from people who fully understand the product. I'm looking to see much higher sales percentage conversions from the tracking software for visitors that come via this keyword / content. I would also expect to see a steady rise in traffic as well because it's my 'hunch' that this keyword will become popular over time. WHAT IS THE ULTIMATE AFFILIATE PROGRAM?